Завораживает. Потрясающе, самый красивый квиллинг из виденных мной! Did you use an reference or was it just out of mind? You're really making me want to whip out the quilling supplies! This is amazing. Impressive! How long did this take you? Looks like it took a lot of patience, too. Did you get frustrated at all, or was a it a relaxing project? 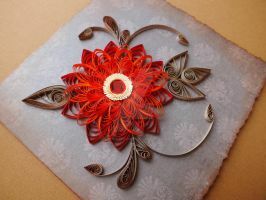 I calmed my nerves by doing this) But actually I do not really cherish the love of quilling. It's a nice piece, anyway, and at least you also calmed yourself while working on this. Thanks for replying! Thanks, I'm glad to hear it!